When I first heard about Slurp!, I was overjoyed. 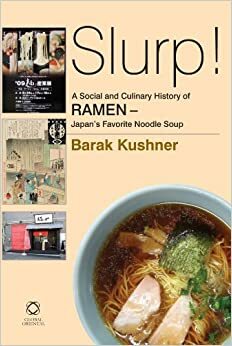 A real book, in English, detailing the history of ramen was something that was just waiting to be written. I always expected that one of the usual suspects would pen something like this; Scholar Nate of www.ramenate.com, or maybe Chef Ivan of Ivan Ramen. Even yours truly has worked on the beginning stages of a book about ramen. Before opening Slurp!, I had a solid idea of what to expect. A chapter or two paraphrasing the history of ramen (check the Raumen Museum site for a quickie), followed by an explanation of different styles, ending with some witty anecdotal stories about ramen and daily life. I expected multiple references to Tampopo. I was totally wrong. Not even close. What we get with Slurp! is an omori sized bowl of modern Japanese history, and how that history shaped the culinary track that Japan was on. It is essentially a commentary on how Japan came to accept meat, and how the chosen meat dish was ramen. From the health issues that arise from feeding a growing nation, to Imperialist expansion, to influxes of American ingredients after the war, the story of ramen is a fascinating one. There is a tiny, nondescript shrine in Hakata that is the birthplace of noodles in Japan? Wheat is believed to come from the body of a being with god-like powers named Ugetsu? I'll let you read it to find out what part of the body. Until fairly modern times, Japan had a huge lack of decent food, and was essentially malnourished? Eating meat could well be the reason Japan is doing so well as a nation today. If you are looking for popular shop info, or any sort of guidance around the modern maze that ramen can be, Slurp! might not be the book for you. At almost a kilo in weight, this one is best left at home (you can order the e-book here). And at just shy of a hundred bucks, this book is quite spendy. I've been told that it was mainly meant for libraries, and that an affordable paperback is coming soon. I will update the Ramen Adventures Facebook page when that happens. You can find out more over at Barak's official site, as well as read some interesting interviews he did. I have a new found respect for ramen after finishing this book. And for all your current ramen shop news, explanations of different styles, and references to Tampopo, you'll just have to wait until my book!